Thanks to immune defenses, our body is able to fight successfully against toxins, microbes, bacteria and all kinds of viruses. Immunity is a natural barrier that will not allow foreign microorganisms to dominate over the organism. "Immunity - a ticket to the world of the living"
The immune system determine which cells are attacked by foreign substances, distinguish them from the other healthy ones and activate appropriate mechanisms to destroy them. Our immune should have three main types of cells: macrophages, T-cells and B-lymphocytes. Macrophages, phagocytes (cell-eaters) –embraces the foreign particles and spend them. Their task is to provide antigens to T-lymphocytes, which in turn indicate the B-lymphocytes the "order" in which to produce the required antibodies. Therefore, macrophages are so-called antigen-presenting cells, T-lymphocytes - helpers (there are two types of T-lymphocytes: T - suppressor and T - killers cells) and B lymphocytes – cells producing antibodies. This trio works together to maintain a constant internal environment and to protect it against pathogens. The immune system is by nature finely polished to perfection, delicately balanced mechanism that, just like any other system, may occasionally fail. The most common type is immunodeficiency. It arises due to hypo and avitaminosis - various symptoms begin to occur, such as stress, fatigue and infection. Without pain, but the man is apathetic, his defense is weakened and adaptive capacities are exhausted. Consequently, any disease has a prolonged character and the process becomes chronic. The most famous and the most severe complications are derived from the disease, which is commonly called the flu. This is an autoimmune disease where the immune system fights against its own tissues. It's like the "madness" of the immune system: instead of protecting the body from foreign substances, it throws on their own. Examples of autoimmune diseases are rheumatoid arthritis, systemic lupus erythematosus, certain forms of renal disease, and liver, thyroid, nervous and circulatory systems diseases. This is an immune disease – allergy. In the last 100 years, allergies appear in the list of the most common diseases. Allergy got its name in 1906 and is associated with the Austrian pediatrician Clements Pirquet, who derived the word "allergy" from two Greek roots: "Allos" (next) and "Ergon" (activity). In people with allergies, the immune system reacts to certain foreign substances insufficiently - hypersensitivity. Such foreign substance is called allergen. That can be food (berries, eggs, chocolate, nuts, etc. ), cosmetics, house dust, pollen and other substances. Thus, the allergic diseases include asthma, hay rhinitis, urticaria, allergic rhinitis, allergies to drugs and food allergies. Generally, allergies are divided into two categories: immediate and delayed. For the first the reaction occurs over 15 to 20 minutes after exposure to an allergen, for the second in the order of hours and days (up to 2 days). Clinical allergy symptoms are swelling of tissue, smooth muscle spasms, characteristic skin manifestations etc. These changes can sometimes be permanent and irreversible. Such condition can be remedied by immunotherapy, which aims to adapting to adverse environmental factors and gaining the ability to optimize the immune reactivity of each individual. To date, there is a defined set of requirements to be met by a modern immunomodulatory tool: soft regulatory measures, a broad spectrum of biological effects, natural (plant origin, receipt via the gastrointestinal tract) use without a prescription. Synchrovital meets all the above criteria. The preparation comprises the complex ResistAid™, which is a combination of arabinogalactan and natural bioactive polyphenols obtained from larch. Arabinogalactan is effective for the modulation of immune responses to the invasion of pathogens (confirmed by special investigations by Udani et al., 2010, Germany). 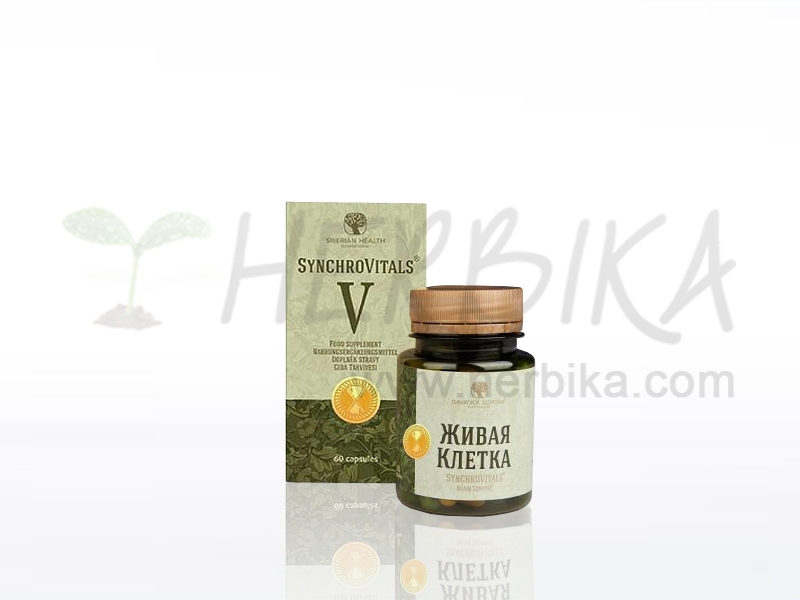 The product has an antimicrobial effect through a balanced content of the combination of plantain, sage and chamomile - plants with recognized antimicrobial and anti-inflammatory effects. The efficacy of the composition is clinically proven.